I know I said in my previous post that the Solar System is not a vortex (and it’s not) but that doesn’t mean there are no vortexes in the Solar System—in fact, thanks to the churning atmospheres of the gas giants, it’s full of them! And that’s no better demonstrated than at the poles of Saturn, where giant hurricane-like storms spin away year after year, powered by atmospheric convection and the rapid rotation of the planet. 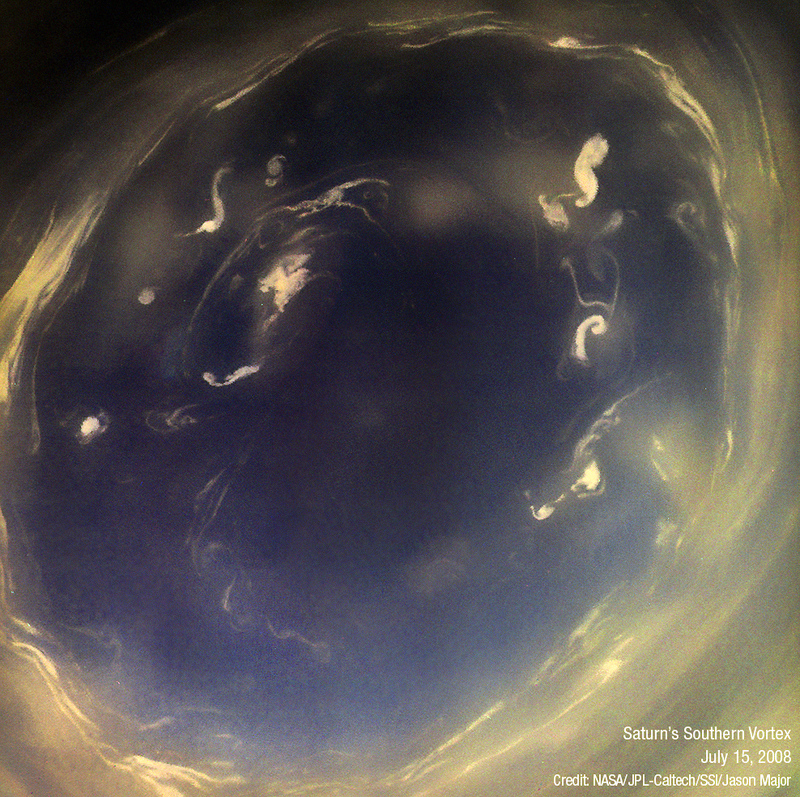 I’ve often posted about the vortex at the north pole of Saturn—and yes it’s quite impressive—but there’s also a similar feature at Saturn’s south pole as well, albeit a bit more subtle and much less turbulent. The image above is a color view, made from raw data acquired in red, green, blue, and polarized light by NASA’s Cassini spacecraft on July 15, 2008. That was a just over a year before Saturn’s spring equinox and the planet’s south pole was moving into shadow, but still had enough illumination for Cassini to capture some images. 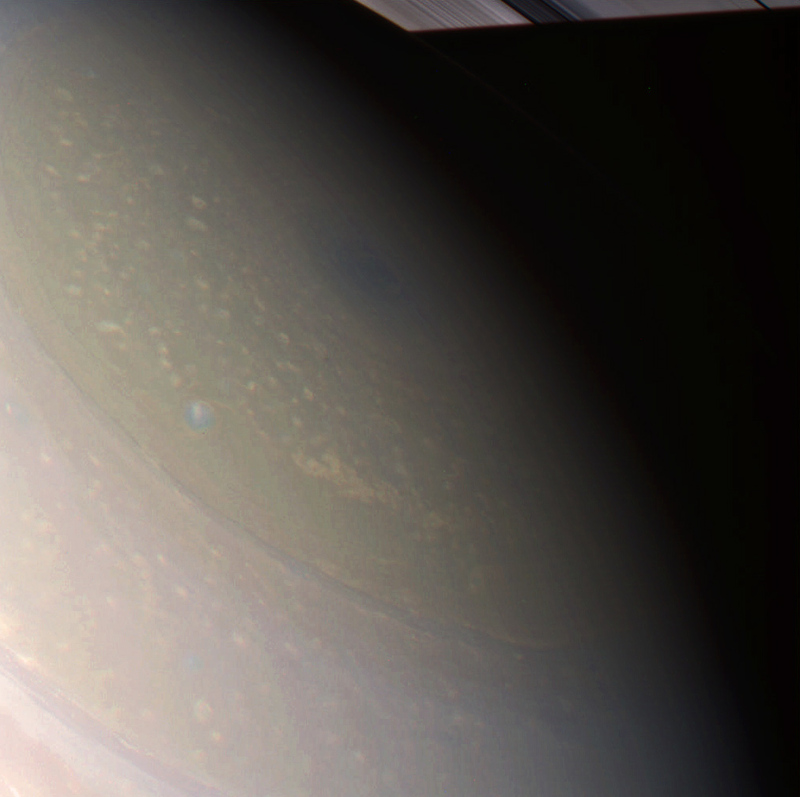 Saturn’s south polar vortex. RGB composite by Jason Major. Captured the same day, the images that make up the picture above were taken from an oblique angle and a distance of nearly 244,000 miles (392,000 km). I combined the RGB data in Photoshop to make a color version. The dark central area is a view deeper into Saturn’s atmosphere, while bright swirls are rising high above the surrounding cloud tops. The entire feature is about 5,000 miles (8,000 km) across—about 2/3 the width of the Earth. 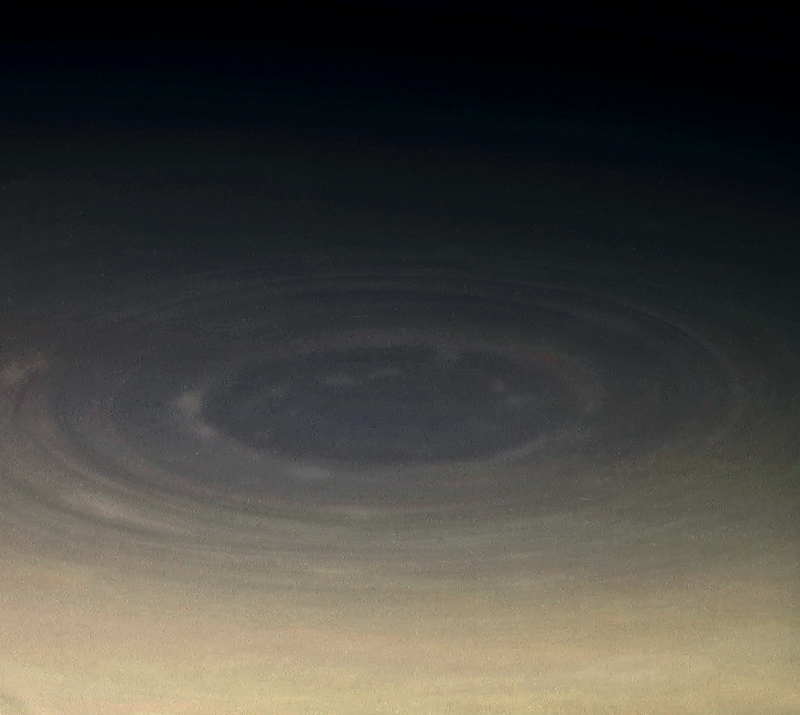 Cassini can’t get views of Saturn’s southern storm like this anymore as the south pole of the planet is now at nearly mid-winter and in seasonal shadow, and Cassini and its mission will be coming to an end in September. Until another spacecraft is sent there, these will remain some of our best—and last—views of the dark storm at Saturn’s south pole. Read more about this feature here and here.